Now you can easily turn the widget borders on and off so you can toggle between showing the blue widget borders and hiding them for a cleaner view of your page. Click the “Preferences” menu in the upper right of the Sitebuilder and choose the setting you prefer. We’ve recently made some updates to our PayPal widgets. The first thing you’ll notice is the new streamlined look and feel. We’ve also added a few simple features that make them easier to use, including remembering your email address when you use the widget again. We hope these features will make the experience of creating a website an even easier one. Improved Site Builder & more New Features! That is great! 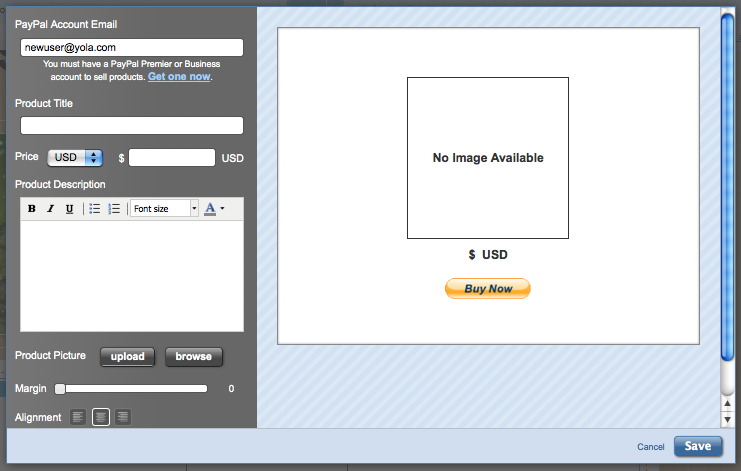 I wish I could use the paypal widgets without having a premium account with paypal. 🙁 Maybe down the road? Although the improvements you were hoping for were not included in this particular release, the changes we made this time were done based on careful research and user feedback. We are confident that they will meet the needs of many of our customers. With that said, we still have many improvements that we are working on, so watch this space for future announcements. I Like the seo management and marketing. The only thing I would like to see with this new feature. I noticed first hand that I was unable to resize and edit my photos; perhaps we can be instructed as to how we will be able to edit our photos. I did however notice once the photo is on your site, one, not all of the frames allowed me to edit from this vantage point. Thank you for your improvments to our sites. I agree these “improvements” are minor if best. The fact that you still do not have effective blogging or a decent photo gallery or slideshow when everyone else does speaks volumes. You do a lot of things very well but these two basic things it just boggles the mind why you have not addressed them with all the request I see asking for them. @ Gy, We appreciate your position and agree that both areas you mention, blogging and photo gallery, need work. I’m excited to tell you that the photo gallery is in the works, but I’m sad to say there are no major updates planned for our blogging platform currently. We agree it’s a shortcoming but it’s not where we plan to devote engineering time at the present. and it’s fast. Speed is the secret in this improvements.